Harry O'Shea - Public Defender: It's been a pleasure meeting you, Mr. Wade. T. M. Wade: I know. 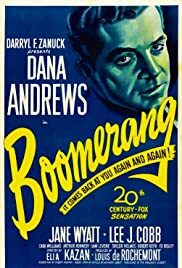 The young ARTHUR KENNEDY was one of our best dramatic actors and proves it in BOOMERANG! by giving a realistic punch to his performance as an innocent man caught in a murder trap. The only man who can save him is attorney DANA ANDREWS, who does a fine job of pointing out weaknesses in the case and destroying the false witnesses. One of the best of its kind, it's done in brisk, documentary style popular in the early forties. Well worth viewing, beautifully directed and acted by a fine cast. Jane Wyatt does a nice job, as does Ed Begley and Sam Levene. Based on a true incident, the murder of a popular parish priest in Connecticut, the film is powerful in its demonstration of our justice system and how it sometimes works, but sometimes fails because of behind the scenes dishonesty related to political shenanigans.